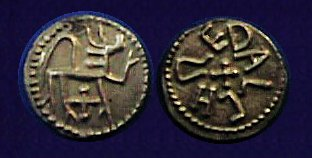 In the area of northern England known as Northumbria, the monetary system began during the late 7th century AD and was based upon a small silver sceat. We can see that the natural laws of inflation unleashed by excessive government spending apllied here in this remote part of England as well. During the end of the 8th century AD, the silver sceat began to suffer from debasement until it finally degenerated into a copper or even brass coin completely void of silver. This area remained independent until 867 AD when it was conquered by the Danes. Thereafter, the monetary system of this region was dictated by that of Southern England and its traditional silver penny.